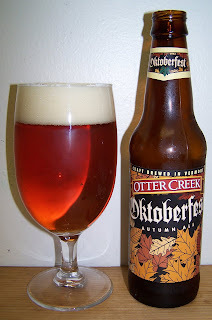 Technically I guess this is not considered an Oktoberfest since this is an ale and a traditional Oktoberfest is a lager. But I am labeling this review as an Oktoberfest just to keep it all straight in my head. This ale pours a nice clear copper color with reddish orange hues and a nice mostly creamy white head. There is also a fair amount of carbonation rising up from the bottom of the glass. It smells delicious with rich sweet caramel malt aromas and a little bit of citrus hops on the nose. Wow, that was like the perfect medium to light body beer. Just a hint of sweetness up front then a nice effervescence, next toward the back end is more malt sweetness then the most pleasant drying hop bitterness and the final finish is just a clean all-around good beer taste. There are just enough finishing hops to dry the finish without leaving you with a lingering hop bitterness. Very nice all around good beer flavors in the brew. Nothing extreme or out of the ordinary just a well crafted refreshing and delicious ale. The head has diminished to just a thin layer over the top of the beer with a nice ring around the glass and very impressive lacing. This is a very nice beer. I love the finish on this. It has a good bite on the back end but it fades away very quickly. The snappy bite or crispness would remind you of an old fashion pilsner but the ale yeast gives this beer much more character. Let’s see what happens as this warms up a little. Still watching tiny bubbles rise up from the bottom of the glass. The thin protective layer of head on the top of the beer will not go away. At 62 degrees it’s just a little smoother than it was. The crispness is not as sharp as it was and there is more of a caramel malt smoothness now. At 67 degrees now and this beer just keeps on giving. That was a very good beer. I’m going to have to pick up some more of this one. I’m going to give this an A-, an Excellent Autumn Ale.